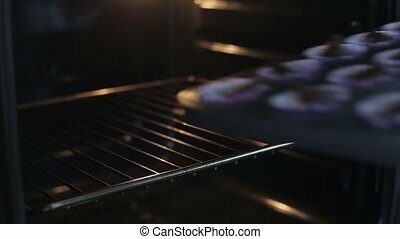 Baking sheet with muffins in hot oven timelapse. view from inside of the oven. 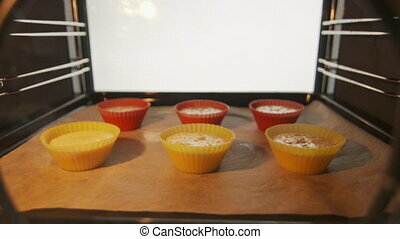 making homemade muffins cupcakes baked in oven. quick sweet dessert for breakfast. using colorful silicone baking molds. 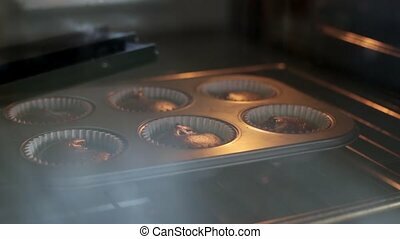 View inside: young beautiful woman opens the oven and puts in the baking tray with cupcakes. Happy female cooking desserts in the kitchen for celebration. 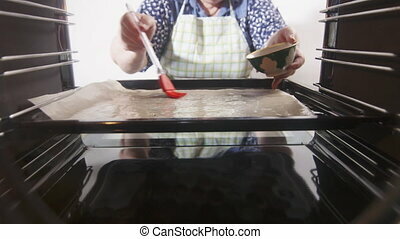 Close-up view of young woman open the oven and puts on the baking dish with dough. Female cooking the cupcakes in the kitchen. Housewife baking muffins, making desserts. Cooking in the oven. The oven is baking meringue. Dessert from whipped egg whites. Cooking treats for the sweet table. Cooking at home, Baking in the oven. Preparation of dessert. 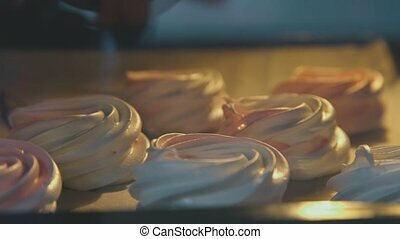 Meringues. Close-up view of baking dish with chocolate cupcakes. 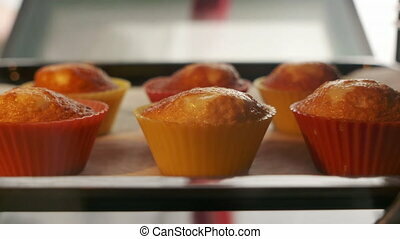 Time lapse of growing of the dough, muffins in baking tray. Preparing desserts in the kitchen for celebration. Conveyor with bread. 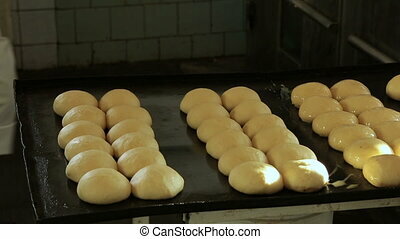 Production of white bread. Baking buns. Raw bread moves along the conveyor belt in the bakery. 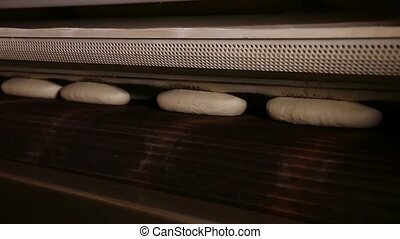 A dough in the form of a loaf of bread enters the oven from the conveyor. Bakers oiled buns lying on a baking sheet before baking in the oven. The rays of the sun fall from the window on the buns. Video shot close-up inside the bakery. 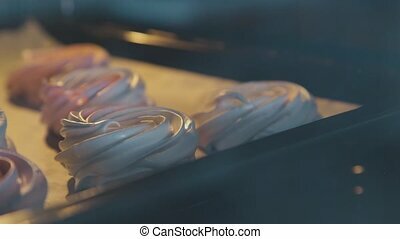 Smearing buns with glaze. 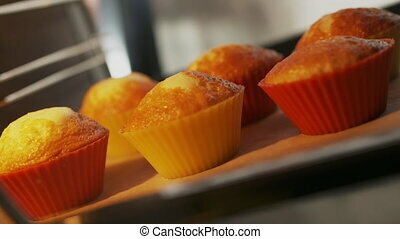 Baking sheet with fresh baked muffins in hot oven. View from inside of the oven. 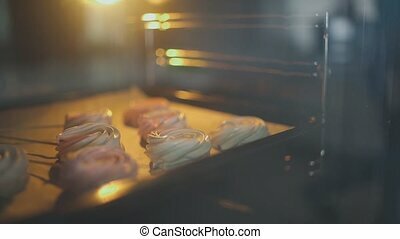 Chef takes the cupcakes out of the oven. 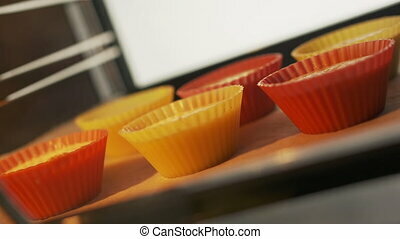 Using colorful silicone baking molds for making muffins and cupcakes. 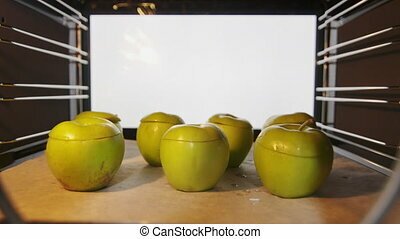 Making baked fruit apple dessert in the oven timelapse. View from inside of the oven. Close-up of green apples are baked on a baking sheet. Cooking food with modern electric convection oven. View from inside of the oven. Baked italian pizza on a baking sheet. Toasty pizza topped with tomatoes mozzarella and edam cheese. Woman takes out just cooked crispy crust pizza from the oven. View from inside of the oven. 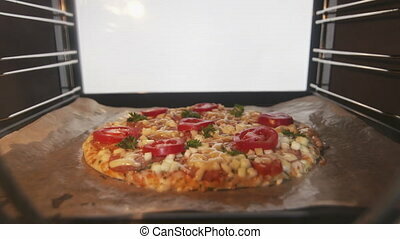 Cooking italian pizza in electric convection oven. 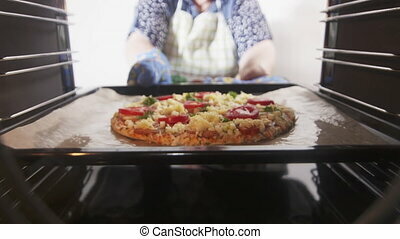 Woman placing pizza on a baking sheet inside hot cooker. Frozen pizza topped with salami tomatoes mozzarella cheese. 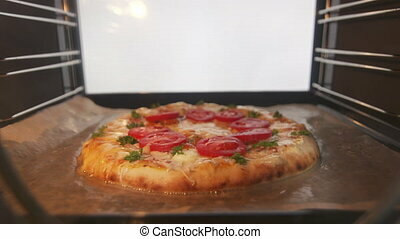 Cooking baked italian pizza in hot convection oven view from inside. 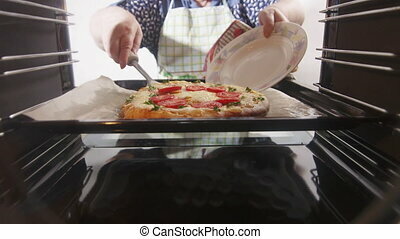 Closeup of pizza topped with tomatoes mozzarella and edam cheese in bubbling oil on a parchment lined baking sheet. View from inside of the oven. Cooking italian pizza in electric convection oven. Closeup of pizza topped with salami tomatoes mozzarella cheese. Pizza cheese melting and bubbling. Timelapse. Cooking food with electric convection oven. 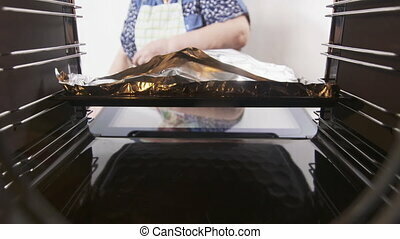 Woman puts the baking sheet covered with aluminum foil in a preheated oven. View from inside of the stove oven. Interior of modern convection oven. Lining baking sheet with parchment. 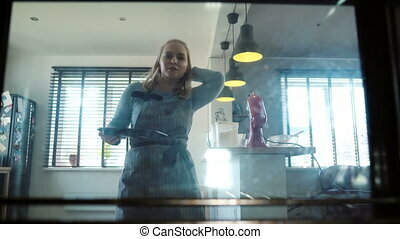 Woman is preparing to bake the dish in built-in electric oven. View from inside of the cooker. 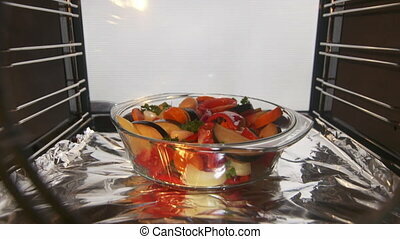 Cooking roasted vegetables in hot convection oven timelapse. Chopped fresh vegetables roasting on a baking sheet under high heat. View from inside of the cooker. Making whole roasted chicken with potatoes baked in the oven timelapse. View from inside of the oven. 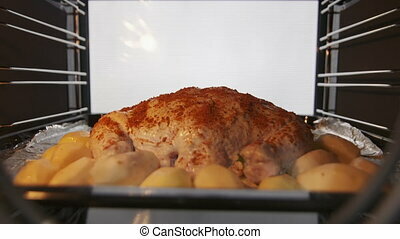 Close-up of chicken and vegetables roasting on a baking sheet in electric convection oven. 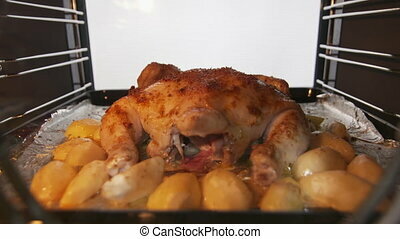 Making whole roasted chicken with potatoes baked in the oven timelapse. Browned crispy chicken and vegetables in bubbling oil on a baking sheet. View from inside of the oven. Convection oven interior. Cooking grilled cheese bread in the oven timelapse. 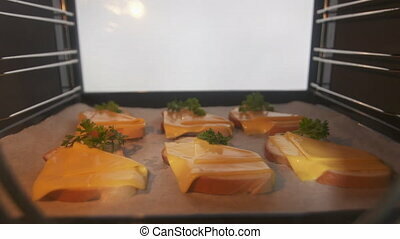 Closeup of baking sheet with cheese toasts roasted under high heat. Cheese melting and bubbling. View from inside of the electric oven.